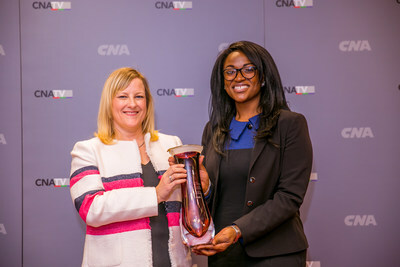 CHICAGO and ORLANDO, Fla., March 21, 2017 /PRNewswire/ -- CNA today announced that Nehemi Janvier, Services and Operations Supervisor within the company's Worldwide Operations unit, received the Susan Kelly Mentorship Award on March 7 as part of CNA's events surrounding International Women's Day and Women's History Month. Sponsored by CNA's Women Impacting Leadership employee resource group, the Susan Kelly Mentoring Award is named for the company's former Vice President of Reinsurance, who unexpectedly passed away in 2013. Susan Kelly was highly respected as a leader and co-founded Women Impacting Leadership to provide a platform for an initiative she felt passionately about — women's professional development. "Susan had a natural ability to teach and guide, which was evident through her leadership at CNA," said Sarah Pang, Senior Vice President, Corporate Communications and Community Involvement, CNA. "Encouraging mutual assistance in professional development, networking and the celebration of professional achievement by women at CNA were passions of Susan. This award embodies all of those passions and she would be thrilled with the work CNA's Women Impacting Leadership has achieved throughout the years." In its first year, this award will now be given annually to a Women Impacting Leadership mentee who is nominated for their outstanding growth and development as a result of the program. Janvier also receives up to $5,000 for a professional development experience. As her mentor, Kathleen Ellis, Senior Vice President, International, CNA, nominated Janvier for the honor. "From the beginning, it was clear that Nehemi loves to learn and loves to give," Ellis said. "Every interaction we have is productive and inspirational. We speak about real issues, and challenges, and consider options that work for the company and individuals involved. I am so thankful to have Nehemi as my mentee, and for the opportunity CNA and Women Impacting Leadership has given us to grow and learn from each other." Founded in 2010, Women Impacting Leadership is an employee resource group for CNA employees interested in discussing issues of importance to women in the workplace. The group's mission is to inspire the women of CNA to their full potential through a community of support, service and learning.